"We provide boat access to the best best parts of the lower 100 -miles of the Deschutes River. These reaches offer incredible beauty. The Deschutes is the best trout river, in the Pacific Northwest with healthy populations of wild endemic Redband Trout, prolific hatches, and Federal "Wild and Scenic River" protection. Much of the river that we float is a tail-water fishery, which acts like a giant spring creek. We are well versed in all trout fly fishing methods; dry fly, nymph, and trout Spey. 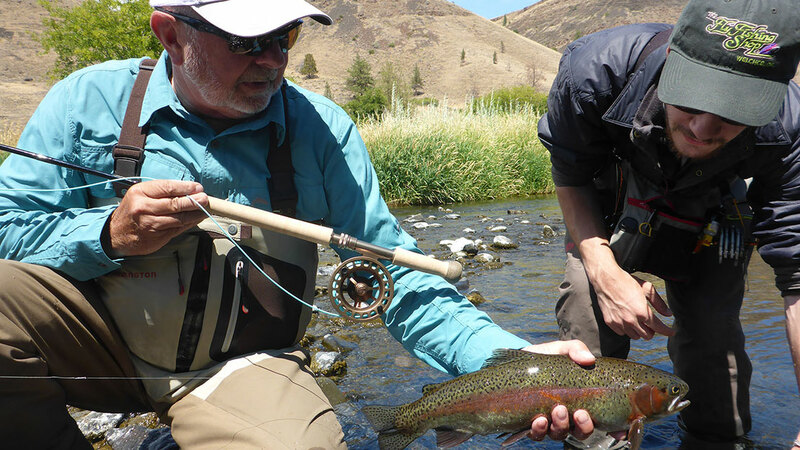 Your trip can be a crash course in how to catch trout with a fly. Beginners are welcome. All you have to do is ask for instruction. Your guide is very experienced in teaching single-hand and two-hand fly rod casting, presentational skills, wading and fly selection. Learn more about the Deschutes River. Deschutes River Oregon float trip prices are $550 per boat. Eight hours on the water is normal. Certain times of the year, it is best to fish during the middle of the day. Other parts of the season it is best to put in late and fish until dark. Daylight to dark is always an option. Hot lunch, snacks, and soft drinks are furnished. Fishing formats can be tuned to fit your personality. Some anglers are aggressive; want to be the first boat on the water, and play hit and run all day. We can do that. We’ve rowed in the dark before. Other anglers have a more relaxed style. We know how to arrange that too. Having your own private school is always an option on any trip. Each boat is equipped with rods, reels and flies. We have the best skills and equipment in the game. Not provided in the price: Deschutes Boater Pass, State Fishing License, Indian Reservation Fishing Permits, Wading Apparel, and gratuities to guides. Standard gratuity is 20%. All licenses and permits are available through us, and we rent waders.